My Technics record player has small vertical stripes on the site of the eh, (sorry , my English is failing on this subject…) plate where you place the records. When the thing rotates, you can check if the speed is correct. If the speed is correct, the stripes seem to stand still. If not, the stripes seem to move. 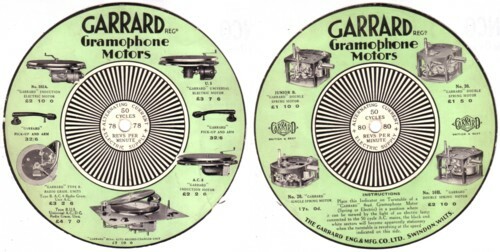 There have been paper devices made for checking and adjusting the speed of the record player. I call them stroboscope disks, but now that I write that word I doubt if this is the true name. It is only mentioned on one of these devises that I have. These kind of record paraphernalia are not easy to collect. I only find them by accident. But I find a lot of delight in adding such finds to my collection. A little problem is that I have no idea where my stroboscope disk collection is. I only found a handful today, but I have more. I will show these as soon as they show up. 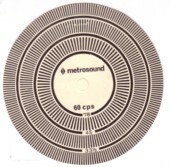 I cannot imagine that there have never been stroboscope disks made that are also normal records, that have music or sound on them. If had a record company back then, I would have released a series of stroboscope records that have songs on them about the speed at which records have to be played. 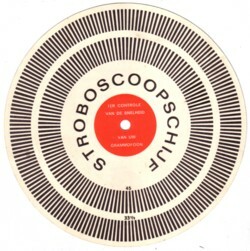 But so far I have never heard of such a stroboscope record. Of course, I have quite a few records with artwork on the vinyl that has some stroboscobic effects, usually called psychedelic. But that is not what I mean. I mean a record meant for adjusting the speed of a record player with the explanation as sound in the grooves. This blog would be a lot easier to read if I wrote it in Dutch. But only for the few people who read Dutch. So you have to do with this amateur English until the whole world speaks Dutch. So far there have been two volumes released in this series of compilations of rare and weird instrumentals. The series is called ”Mind expanders” , and if you have never heard of it, they are worth searching for.